We have lift off! The EOS mainnet launch had a unanimous “Go” vote on Friday, June 8th, 2018. A date that marks a time in History we shall never forget. Now that the mainnet has launched, everyone is abuzz with the upcoming airdrops. Airdrops are the new ICO. Instead of raising funds and possibly getting into trouble with the SEC. Dapp creators are gifting users with their tokens and keeping 30-40% for their development needs. This structure creates immediate adoption with a large user base. 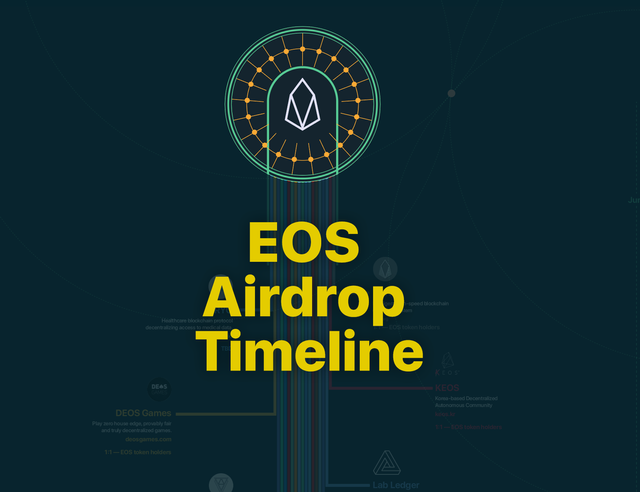 We at EOS Tribe believe the airdrop model will quickly outpace and outperform the ICO model. There is a time and place for raising funds in a traditional way, but in EOS, a new paradigm shift is upon us. Be prepared! Below we created a timeline infographic of the upcoming airdrops. Some of them give to token holders from the genesis snapshot but others will be given to token holders at the airdrop date. Enjoy! Do we need to do something in particular in order to get airdrops? Just hold eos? Some of these airdrops need actions in advance. EON, for example, you have to claim by send 0 ethereum to their address before June 2nd. Lab Ledger, in the other hand, its website is not accessible and I believe they used snapshot of May 21st. Nice graphic. Given the current bear trend in the crypto markets and the slow progress of eos voting, we need some positive news. Great work.